I am a visual artist, a creative dream strategist and founder of The Ruminate Project. I was born and raised in the farmlands of southern Wisconsin and first came to Charlotte in 2008. Quite some time passed by before I finally fell in love with my city and the emerging vibrant culture that is oozing out everywhere. I am extremely fortunate to be able to refine my work during such an important time of creative and cultural growth in Charlotte. 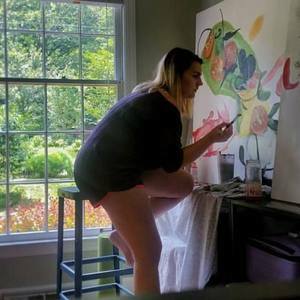 I gained a surge of momentum in my life and in my art as I began to understand my artistic ability as a tool for sharing experiences, my voice and the voice of others. Through observation of the passion and unique idiosyncrasies of others I use my canvas to create a platform to immortalize the soul-stirring stories that I hear. This is the work that I hope to spend a lifetime doing in order to fully capture and express the captivating spirit of optimism and adventure that moves us all. From my perspective creativity has no boundaries unless we individually put them there. I created The Ruminate Project to focus on collaborative projects that evolve the way we define and the way that we encourage creative expression. By massively supporting the creativity that goes beyond traditional arts, we can offer individuals the opportunity to remain focused on understanding their passions and the freedom to eliminate the fears that have created boundaries.